Shire Bunny Playhouse features an Optional Raised Platform. Children just love to have their own little Den in the Garden! Secret and Hidden away or raised on the platform and pretend its a Fort or Tree-house. The Shire Bunny Playhouse is a perfect escape in the safety of your own garden where the children can play away happily and safely! Image shows product with a painted finish for illustrative purposes only and it is not included with the product. The playhouse is supplied with a basecoat treatment. Review - This is a good looking playhouse for a reasonable price but unfortunately required more work than anticipated to build. We found timbers were of varying sizes when they were supposed to be identical, some timbers arrived slightly twisted and the screws supplied with it were useless. Also be aware the footprint with the platform is 1850 x 1250 not 1100x1100 as all the instructions suggest. It recommends sitting the platform on paving slabs which is totally insppropriate for a children's playhouse, and the veranda on the platform is open on one side so needs a barrier to be added for safety if young children are to use it. 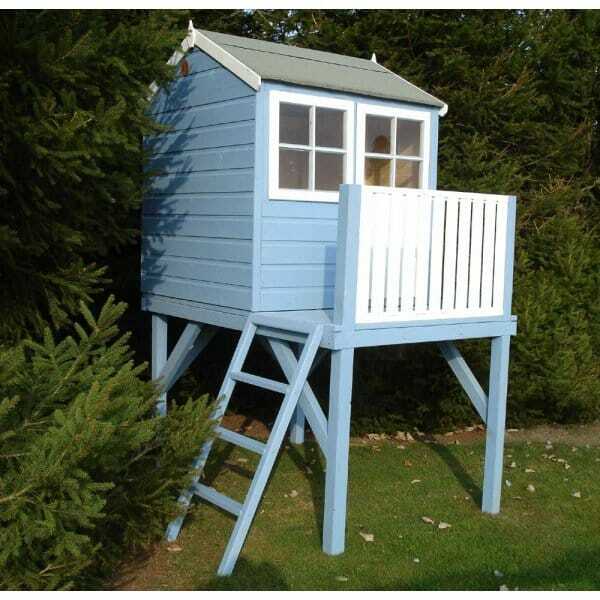 This is a good looking playhouse for a reasonable price but unfortunately required more work than anticipated to build. We found timbers were of varying sizes when they were supposed to be identical, some timbers arrived slightly twisted but all fixings and the screws were supplied. Also be aware the footprint with the platform is 1850 x 1250 not 1100x1100 as all the instructions suggest. It recommends sitting the platform on paving slabs which is totally inappropriate for a children's playhouse unless it is then covered in bark chippings etc as the manufacturer suggests, and the veranda on the platform is open on one side so needs a barrier to be added for safety if young children are to use it.